India Gate is perhaps the most appealing and important tourist attractions within the city of New Delhi, the national capital of India. Originally called the All India War Memorial, the India Gate is a war memorial monument located across the ceremonial Rajpath. This magnificent historical war memorial monument is constructed for and dedicated to 82,000 brave soldiers of the Indian Army who laid their lives for the sake of the country in the period of 1914-21 in the First World War and the Third Anglo-Afghan War. After Bangladesh Liberation War in the year of 1971, a small and simple structure, comprising of a black marble platform, with a reversed rifle, topped by a war helmet, enclosed by four eternal flames, was constructed underneath the towering India Gate War Memorial Archway. This is structure is called Amar Jawan Jyoti or the Flame of the Immortal Solider. This structure has served as India’s Tomb of the Unknown Solider since 1971. The cornice of the India Gate War Memorial is engraved with the Imperial suns while both sides of the arch have INDIA, flanked by the dates MCMXIV (1914 left) and MCMXIX (1919 right). You can also see names of 13,300 servicemen’s names including some soldiers and officers from the United Kingdom, inscribed on the gate. This historical and magnificent war memorial monument was designed by Sir Edwin Lutyens. 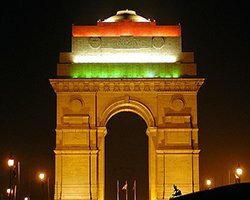 India Gate is very popular among Delhiites and tourists coming from different parts of the world, not only because of its historical importance but also for its beautiful locations around including the beautiful Children’s Park. The park is equipped with children’s facilities. India Gate along with its surroundings has been a one of the most favorite evening spot for Delhi’s folks. Canopy behind the India Gate is a beautiful structures. At evening you can spend here quality and leisure time. You will find here several vendors selling street foods and other items. Boat ride can be also enjoyed here.